The Central Mission is a mixed residential and business neighborhood surrounded by some of the highest-traffic commercial streets in San Francisco. Our diverse membership includes people who have lived here their whole lives, people who have just moved here, and everything in between. We include English and Spanish speakers, renters and owners, and people from a multitude of different backgrounds, all united by the conviction that by working together to address the issues and opportunities in our neighborhood we can make life here better for everyone. The Central Mission Neighborhood Organization (CMNO) represents residents and businesses within the area that extends roughly from Capp and 17th Streets to Harrison and 22nd Streets. The issues addressed by the CMNO are determined by our membership. The real work takes place in independent committees that report to the entire group at our monthly meetings. We have ongoing relationships with District 9 Supervisor David Campos, with many City agencies, with Captain Moser of the SFPD's Mission Station, and with many other citizen groups active in our area. We also have the capacity to receive grant funding for specific projects and the ability to make use of many different technologies to achieve our goals. 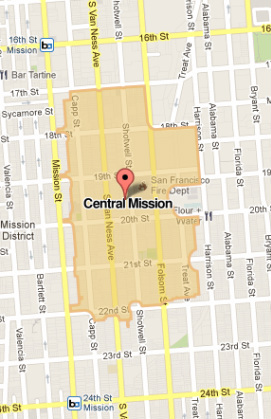 We usually meet once every quarter at the Mission Neighborhood Center, 362 Capp Street, at 7pm. Join us! Online, we're active at NextDoor.com -- if you live or operate a business in the Central Mission, you can join us there. Or you can get in touch via our contact page. And you can even "like" us on Facebook!